OK, growing up on the West Coast, we got lucky with the plethora of monster gigs that came our way. Specifically when they were SST Records-related and usually featured Black Flag and their cohorts at mammoth places like the Santa Monica Civic, Hollywood Palladium, Devonshire Downs and the Olympic Auditorium. These were events, man, gigs you knew were special then, but had no idea you'd still be talking about them 30 years down the line. 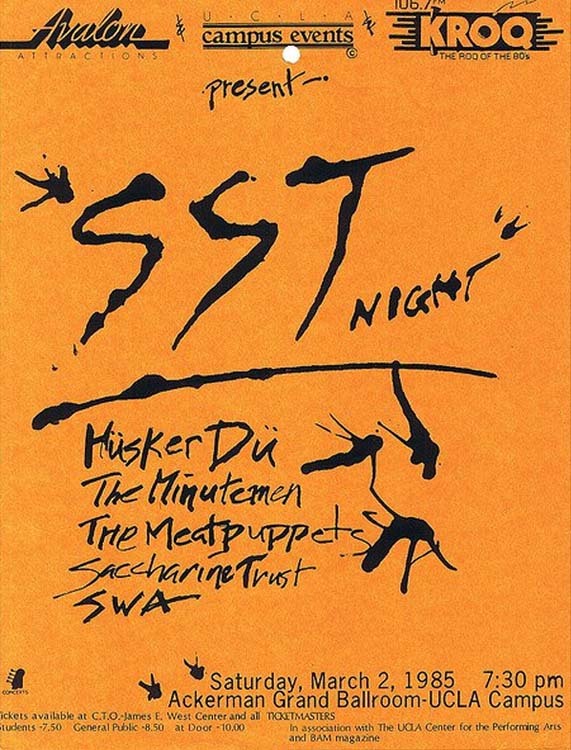 In late February, early March of 1985, five little bands by the names of Husker Du, Minutemen, Meat Puppets, Saccharine Trust and SWA embarked on "The Tour," which took them to the Keystone in Palo Alto, the Stone in San Francisco, the UCLA Ackerman Grand Ballroom in LA and the Rock Palace in San Diego (this show is also listed as happening at Carpenters Hall). I attended both the UCLA and San Diego shows, and Cat and her friends invaded the UCLA gig, her future alma mater. This was before Cat and I knew each other (we went to the same high school-- we knew of each other, but had never talked). I witnessed her and her friends ride around on some wheeled speakers and mess with the soundboard after the show. No one seemed to mind. Unfortunately, the UCLA one was marred by some jackass throwing a bottle at the stage during the Huskers' set and plucking Grant Hart. The Husker drummer was singing at the time and stopped his double duties, stood up and yelled that whoever threw the bottle was a coward. It was a tense moment and the Huskers didn't finish their full set that night. Great evening all around, and this time no stupidity from anyone thowing things from the crowd. Mike Watt was all smiles as he sported a handmade cardboard sign duct-taped to his head during the Minutemen's set. It probably said something about "econo." Following the '85 gig, I spoke with old friend Bob Mould for a bit and mentioned that "Makes No Sense at All" was a great new song... he answered, "Yeah, that's the one." Wow, thank you for posting this, I was at that UCLA show all those years ago! My girlfriend Sheila, my college roommate Brad and I drove up from Orange County to attend the show. We were three preppy looking kids in a sea of punks and felt a little out of place, but it was a great show. We got there early and staked out a spot front and center of the stage. We managed to stay in that spot through SWA, Saccharine Trust, The Meat Puppets and a little way into The Minutemen’s set. It got too intense for my girlfriend at that point though with all the moshing and pushing, so we literally bailed out over the front barricade and security pulled us over to the side. I remember there were cameramen there filming the event and they filmed us coming over the wall. I’ve been searching for footage of that show for years though and have so far turned up nothing. The SF show seems to have been pretty well documented but virtually nothing exists of the UCLA show (save for a few pictures and an obscure audio cd). We watched the remainder of the show from farther back in the ballroom. I totally remember Grant Hart getting hit with the bottle (I swear it was only like 2 or 3 songs in) and then they pulled the plug. It was a pretty abrupt ending but I was still extremely stoked to have been able to have been there that night. Even more so, given that fact that less than a year later the great D. Boon was gone and 2 years later my friend Brad was dead. I’ve seen a lot of bands since then, and done a lot of other things in life, but seeing that SST show was one of the highlights of the time I spent in California. I was 21 years old then and I am 49 now, but it really does not seem that long ago. Andy, Thank you for this. 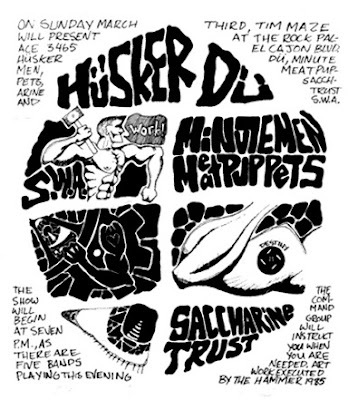 The UCLA show was the first time I saw Huskers. Great... man, SO loud! I'm writing a piece on those great punk years, and trying to remember when X played the same venue, Ackerman Grand Ballroom, I think in '81. If you know, can you post here? I'm running out of leads! Thanks and best! Hi there, don't know about that X gig. Thanks for reading!